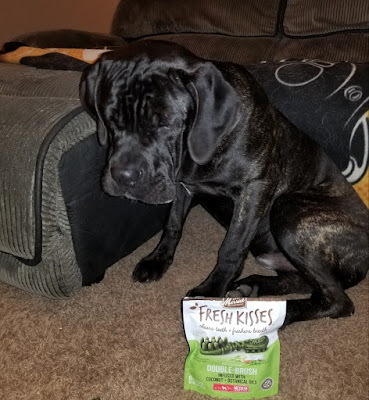 The grain-free formula is easily digestible since it’s made with natural peas and gelatin with no potatoes or anything artificial, and infused with coconut, peppermint, lemongrass, and rosemary oils to keep the doggy smooches going. Perfectly sized for large dogs, it’s safely cooked in the USA without any grains, gluten, corn, soy, or artificial flavors, colors, or preservatives. Enjoy sweet kisses from your pup with Fresh Kisses Double-Brush Coconut Oil & Botanicals Large Grain-Free Dental Dog Treats. This uniquely designed treat has a double-brush action and a special blend of coconut oil and botanicals to help keep teeth clean, fight plaque and tartar, and freshen breath. Formulated with coconut oil and a special blend of peppermint, lemongrass, and rosemary oils to keep breath fresh for on demand smooches. These dental dog treats come in four different sizes: x-small, small, medium, and large! Even though are dogs are very large, we got the medium Fresh Kisses and they were perfect! The dogs loved the taste of these long-lasting dog treats and we all loved that it gave the dogs fresh breath!